Our aim for this project was a deep renovation of an existing dormer dwelling with attached garage. The brief from the clients was to re-imagine the existing spaces in the dwelling together with creating an open plan kitchen, living & dining area. They were also keen to greatly improve the energy efficiency of the dwelling. The first floor of the dwelling was altered to include 2no. double bedrooms one with an en-suite and wardrobe & one with an en-suite. A home office is also located on the first floor. The ground floor consists of an open plan kitchen, living & dining area with separate living room, master bedroom with en-suite & wardrobe, WC & utility/plant area. The project involved extensive demolition to the existing building including removing the entire ground floor and upgrading the insulation to a highly energy efficient standard. 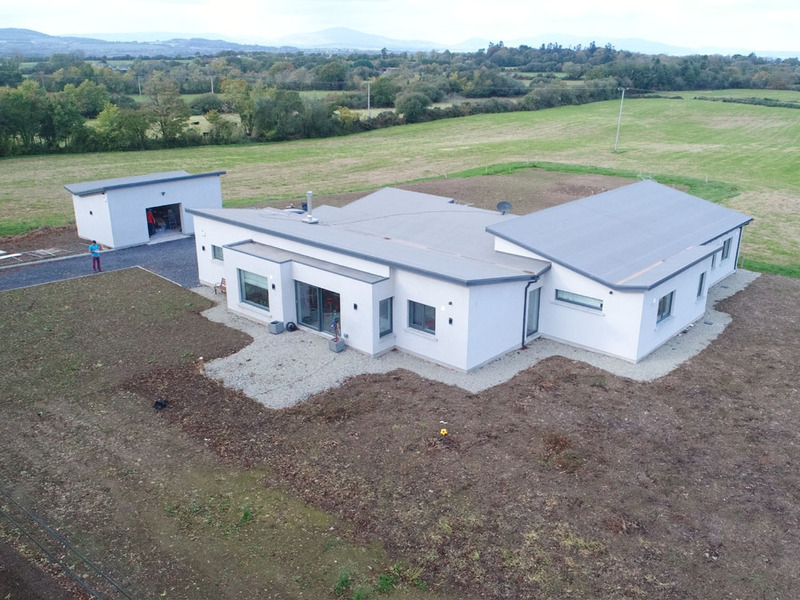 The existing cavity walls of the dwelling were pumped with beaded insulation in conjunction with the entire dwelling being wrapped with an external wall insulation system. The heating system was totally overhauled to include a deep borehole heat pump with underfloor heating to the ground floor. Photovoltaic panels were installed on the roof with a battery storage system to store electrical energy. The external windows & doors throughout the dwelling were replaced with energy efficient triple glazed alu-clad units.